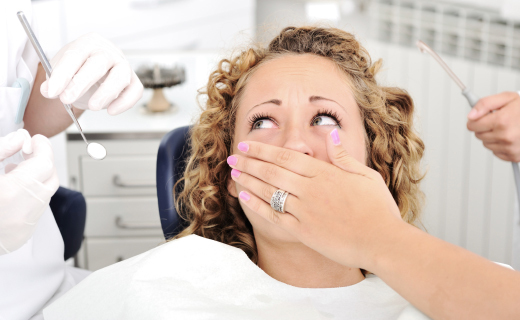 April is observed as National Anxiety Month in America, and a study conducted by Delta Dental has revealed interesting evidence that dental fear is a learned behavior. According to Delta’s nationwide poll, about half of participating parents with kids aged 12 and under are afraid of the dentist. The number of kids who share the dental phobia matches perfectly. Experts believe that this demonstrates children’s ability to pick up on their parents’ dental fear and mirror it. To avoid instilling dread in the minds of young dental patients, parents should stay calm during dental appointments, and only present the topic in a positive light. At least 40 percent of children have some degree of dental phobia that makes their dental visits frightening and uncomfortable. Parents polled by Delta Dental reported that the threat of pain is the most common source of anxiety among kids. Among lesser fears were not liking the dentist and being told they would need more dental work. To help allay dental fears, parents should start exposing their kids to dental care early, so they can build relationships with their dentists. A baby’s first dental appointment should be made no later than his or her first birthday. Informing the dentist of a child’s anxiety before the visit and playing dentist at home can also help lessen stress. Parents can reduce the chances of passing along their fear of dentist appointments by managing their own anxiety. Talking to the dentist about a dental phobia or seeking a dentist who specializes in treating anxious patients can be helpful. Other ways to reduce dental fear include taking a friend to dental appointments, making appointments for first thing in the morning, and listening to music during treatment. Severe dental phobia in adults requires more intensive management such as sedation dentistry and professional anxiety treatment.